Well down for breakfast, one other couple in residence a North American couple our host Malcolm was attending to them, we were placed in the window and as we were short of glasses for fruit juice as Malcolm hadn’t really told us the Format at Breakfast Colin found a box full of glasses on the table and removed 3, much to everyone’s amusement as they were for a local charity shop. Apart from that breakfast was fairly uneventful. Pleasant meal, plenty of cooked breakfast, for the ride ahead. Ok breakfast over and time to put stuff together me on a borrowed bike and Hartside up ahead. Ah well here goes. As we loading our bikes in the garage I noticed a very dusty but serviceable Raleigh Pioneer mountain bike laying in the garage, we checked it over and it looked a good bike. What to do? Malcolm said just take it but I won’t be responsible for any breakdowns, No problem. So Day 2 of the Holiday I’m on Bike 3. Colin transferred the gear and my front panniers, gave it a quick service raided Malcolm’s washer supply whoops we didn’t tell you that! And I had small ride around Appleby it felt OK. So we were on our way again. Since returning I have contacted Malcolm at Bongate House and asked when he wants the bike, He is not in a hurry and has suggested he’ll collect from me? He is looking forward to the Journal of the ride and is getting much mileage telling stories to other Cycling guests of the Multidaymen hitting town? Never a dull moment. Malcolm Dayson, Knight of the Road award nominee for 2005. Out of Appleby on Election Day a little later than planned. Straight into the climbs we were now on The Pennine Cycle way North and following Sustrans signs. Much to our Colin’s consternation. It was steady climb out of Appleby into a brisk wind on a cool morning on a new bike which I was getting used to! It was polling day as we rode in the mist and gloom along the villages at the foot of the Pennines. All very austere places, with very few people around. It was an undulating ride and we made steady progress knowing Hartside Pass was waiting for us and me on a borrowed bike. I was getting used to the bike; it hadn’t been ridden for a while and was talking some freeing up. We had a stop in Milburn it was drizzling so we ate or biscuits and drank Graeme’s famous hot chocolate. What a damp cold day the only thing exciting to read on the Milburn notice board was the Police messages. 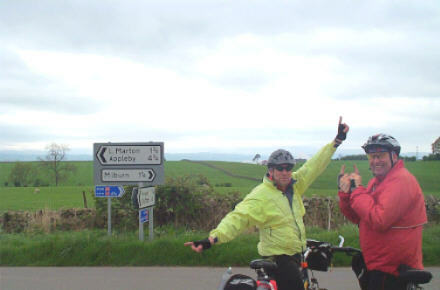 We slipped out of Milburn and hit a junction 4 miles to Appleby yes we’d cycle 11 miles to be 4 miles from where we set off, but as Graeme reminds us it’s the route? The road meandered and climbed and then we had a long roll downhill through Skirwith and an encounter with a wild cow. A lady was letting her cow out of her yard onto the village green just as we cycled through and we all had to jam on our brakes, she got a shock the old cow just carried on its way. And onto Melmerby last post before Hartside, we stopped at the well advertised village bakery in Melmerby it’s in all the tourist literature, OK it was warm and the staff were pleasant but it was very overpriced. For organic Tea and scones. We watched it rain and girded up our loins for Hartside, we’d decided to ride the road up the back from Renwick and stay on the Tarmac all the way, at this point several cycle routes merge, the most famous being the C to C which both Colin and I have done and made the mistake of using the off road section. Which is very hard going and almost impossible to cycle! And we were straight into it. A long steady climb, crawler gear and all riding together, helping each other up. Graeme calling out instructions on breathing "Whose breathing". In through the nose, out through the mouth. Colin doing his own style, we all grind up slowly slowly. Just before the full corporal as we were digging in for the climb right on "Q" I got a text message from Jill. I had to stop Graeme stopped and we all had a good laugh, her timing was impeccable. We had a few minutes rest and then back into it. We hit the main road and the team stayed together we rode within 10 yards of each other all the way up, encouraging each other. As we hit the main road it was a good feeling because cars descending were flashing their lights and waving encouragement to us, lots of thumbs up, I think everyone knows it’s a long hard climb. Even worse in the bad weather In fact when we made the summit visibility was so low, down to 10 yards you couldn’t even see the café, nearly cycled right by. Into the warm Café. 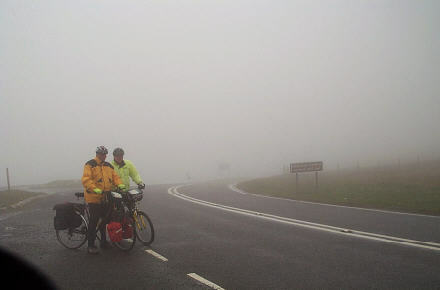 Ten years ago I’d been doing the coast to coast in September and the weather was just the same. 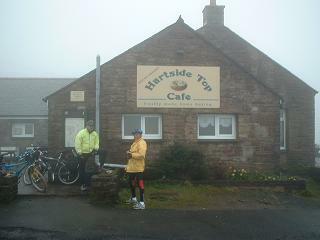 The most pleasing thing was I rode Hartside without pushing on a borrowed bike too. 10 years ago I pushed most of the way. We all went into the Café for Turkey Buns with cranberry and stuffing and hot mugs of tea, Colin had a sausage bun and Graeme had to have a sticky bun too. The waitress said, "Are you on your bikes?" Graeme replied, "Who’d be daft enough to come up here today on a bike" Which caused great hilarity? 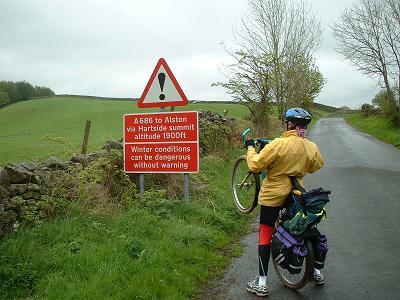 What goes up must come down and although it was wet and horrible we had a lovely 4 mile descent into Alston and The Cumberland Hotel on the main road right on the route. A Good hotel too, currently under refurbishment, but we had a good family room, landlord seemed a real good bloke. Bikes put away, we showered changed and Graeme and I had a beer Jennings plus some other funny stuff to have later, Yates was the pint that night. Colin appeared and we all had a walk around Alston just a leg stretch, back to the Hotel for a good plate of dinner followed by a couple of pints, It was also Quiz night, well in The Woodside Hotel Chesterfield it was, but The Cumberland Hotel Alston took part via a phone link through Jill. Jill was with her mates in a pub in Chesterfield ( ladies in two teams) what they didn’t know they rang us. We in turn asked the Assembled hordes at the bar and so you get the picture. The Cumberland Hotel via a few phone calls answered several questions in a Pub in Chesterfield. There was also a very strange man in the hotel obviously walking the Pennine way; he was asking the barmaid for maps and all kinds of questions which he should have sorted himself. He was the strangest individual asking some scary questions. After a great night in the Cumberland Hotel it was time to hit the sack and I don’t take much rocking. Although Colin was staying awake to watch the Election results come in.